When I heard about Flappy Bird for the first time, the hype was already in its final phase: developer Dong Nguyen had decided to pull the app from the stores in “22 hours from now“. Apart from overreacting users and an allegedly daily advertising revenue of up to 50,000 US$, the simple game mechanics were something that caught my attention. The concept of clicking/tapping to keep the player on track wasn’t really an innovation in itself, but given the hype it caused, it was certainly worth a closer look. As a Sunday evening challenge, I tried to reproduce the game mechanics and ended up with less than 200 lines of code. Update Feb. 20th: I added the score counting part and included suggestions by readers Sascha and Nico. Updated code is pushed to GitHub. Update Apr. 9th: Sorry, I currently don’t have time to update the tutorial. In the meantime, take a look what reader Daniel Bocksteger built with the learnings from this tutorial: Coin Catcher. Since the app was already removed from the stores when I started working on the clone, I had to rely on screenshots and videos of the original game to reproduce the individual sprites. I used The Gimp to produce the bird (two simple frames for animation), the pipes (upper and lower version), the distant background and the ground. Note that the created files are a little too small for an iPhone display. Therefore, in the course of this tutorial, you’ll see that I simply doubled the size by scaling every sprite by a factor of 2. In order to maintain the 8 bit retro look I changed the filtering mode of the textures from SKTextureFilteringLinear (standard) to SKTextureFilteringNearest. You can download the created files with the final project. 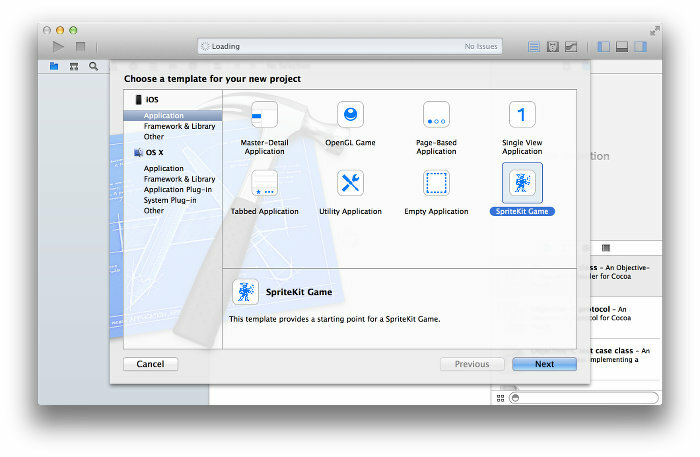 iOS 7 comes with a great new framework called Sprite Kit. It hides lots of the iOS UI development details game programmers are not necessarily familiar with (outlets anyone?) and builds upon a basic game infrastructure they are are more used to (e.g. rendering loop and scene graph). For all iOS developers, focussing on the game mechanics becomes a breeze. 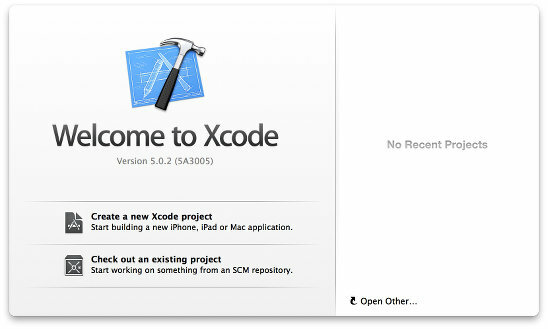 When Xcode starts, simply select “Create a new Xcode project” from the splash screen. 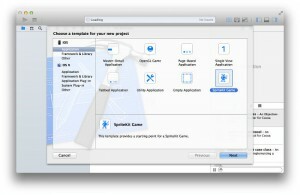 From the available project templates, select “SpriteKit Game”. Now enter some project details. You can change them later if you need to. 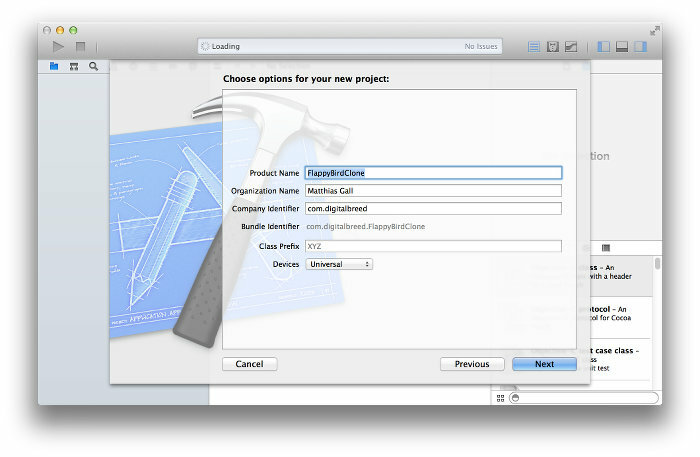 Select a place to store the project files. I usually create a new subfolder in my Documents folder. Finally, the project is created and we’re ready for development. 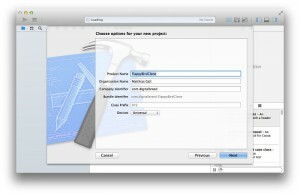 The template project comes with some sample code and assets that need to be removed. Delete the Spaceship.png graphic from the project and add the Bird1.png and Bird2.png files instead. 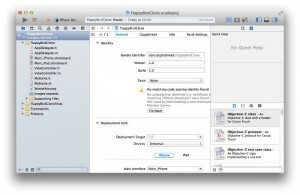 Also remove the existing code in the initWithSize and touchesBegan methods of MyScene.m. 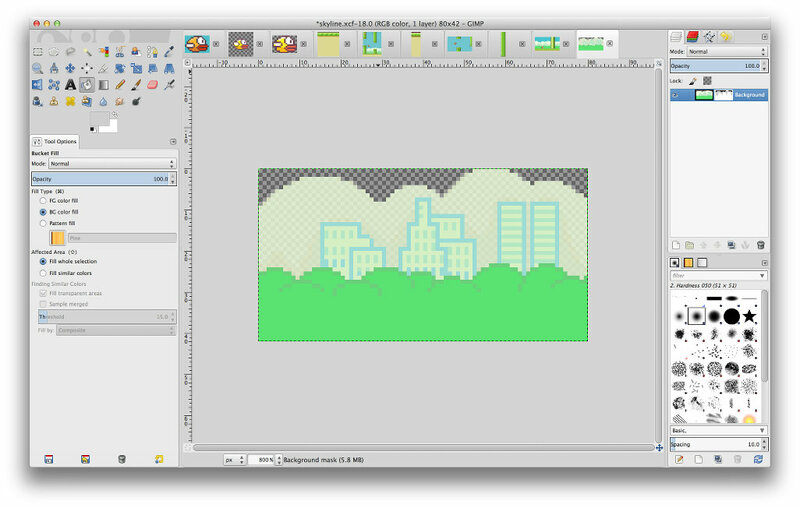 In initWithSize, create the bird sprite and add it to the scene. To access the bird easily from other class methods, we declare it as an ivar. One important thing to remember is that the SpriteKit’s scene coordinate system has it’s origin at the bottom left point and the positive y- and x-axes extend to the top and right of the screen. A sprite’s default anchor point is always the center. 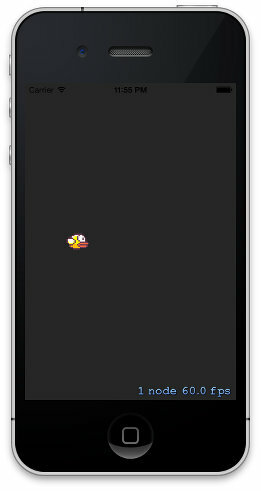 Using the code above, the bird is placed on the vertical center and end of the horizontal first quarter of the screen. Hooray, we’re nearly there! It won’t get much harder than that, believe me. Animating is pretty easy thanks to SpriteKit Actions. We simply create a sequence of texture-changes and loop them endlessly with a little delay in order to produce the illusion of flapping wings. I believe that the original game used some more frames, but we’ll go with two for the sake of simplicity. We’ll have to load the second bird sprite, too, produce an SKAction to animate them, and attach this animation to the bird. The background and ground sprites are repeating patterns. 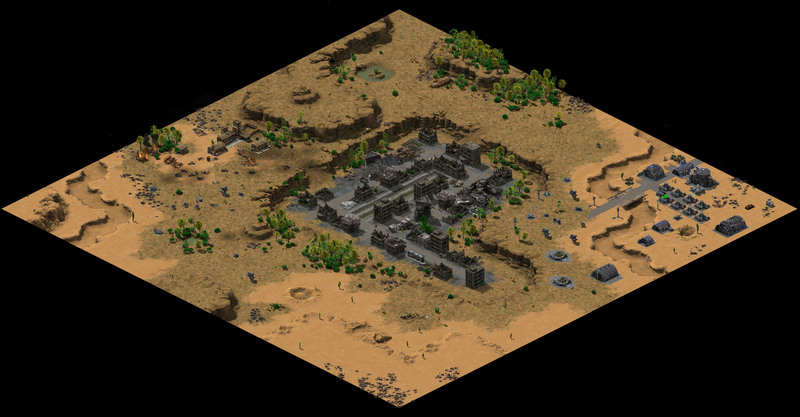 After adding Skyline.png and Ground.png to the project, we setup the textures first and then fill the full screen width with the sprites. This leads to the following static scene. You may have noticed that I created one more tile than necessary. This is required for the animation: We can create the illusion of movement by simply moving each sprite to the left for a full width and then resetting it to the original position. When the tiles wander to the left, a gap opens at the right edge of the screen. We use the extra tile to fill that gap. Two layers of the scene are scrolling with different pace (speed scale factors 0.1 and 0.02 above), leading to an illusion of depth. 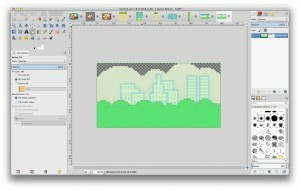 This effect has been used in 2D video games for ages and is called parallax scrolling. Until now, everything in the scene is just fake. The bird doesn’t even move. But we can easily enable the SpriteKit physics engine in order to add some realistic movement to the scene. SpriteKit allows to attach a physics body to every scene node. The physics body has certain properties like mass, density, friction,… and it can interact with other physics-enabled entities in the scene. Once a physics body is created, the owner node is controlled by physics. Let’s start with the bird. We will represent it’s physical shape by a circle. When we start our clone now, we’ll see the bird falling straight down – and out of the screen. In order to avoid that, we will have to create a physics body for the ground as well. We could attach it to each of the ground tiles, but remember that they’re continuously moving left and then resetting their position. This could lead to some strange effects once the bird collides with such a ground tile. So instead, we can simply create an empty node with a rectangular physics body which spans the full ground. Note that the bird has property dynamic set to YES, while the ground (and all other “static” entities) have dynamic set to NO. This is because that only the bird is affected by interactions with the physic world. The remaining entities are under our control and won’t change their position or rotation e.g. due to a collision. With these changes in place, you’ll see our little bird falling to the ground. The bird is falling a little too fast for my taste. We have multiple options to control this behavior, let’s try the easiest and most obvious one first: we’ll change the world’s gravity! This will reduce the gravity from an authentic -9.8m/s^2 to only -5m/s^2, making the bird falling slower. I strongly encourage you to experiment with these values. While we’re at it, we can also change the bird’s rotation depending on it’s velocity. If it’s flying upward the beak should point to the top right; if downward, to the bottom right. This can easily happen on a per-frame basis in the update:currentTime method, which was unused up to now. As you can see, I use the bird’s physics body velocity property which is maintained by the physics simulation. I added a little helper function clamp which avoids too large values in either direction. Note that the minimum and maximum values (-1, 0.5) are radians. 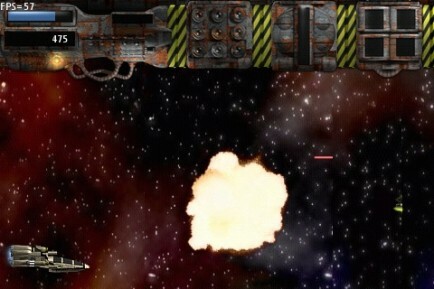 The last game entity are the pipes which are moving in to the scene from the right and need to be avoided. As before, the pipes are textured SKSpriteNodes, they will be animated using SKActions and they’ll get a physics body attached for collision. Add the two pipe graphics Pipe1.png and Pipe2.png to the project. From a graphical perspective, the pipes are a special entity. While the ground and skyline are always attached to the bottom edge of the screen and the bird always has the same dimensions, the top pipe has to extend from the top edge and the bottom pipe has to extend from the bottom edge. While this could be solved programmatically with the benefit of saving some texture space, I decided to use very high textures instead and not worry about display size anymore. While pipes consist of two SKSpriteNodes, I wrap both nodes into one empty SKNode as a parent. This has the advantage that it is sufficient to position the parent node in the world, while the two childs are positioned relatively to their parent node, so I only need to worry about their vertical position. The distance between the upper and lower pipe is arbitrary, I chose 100 points. 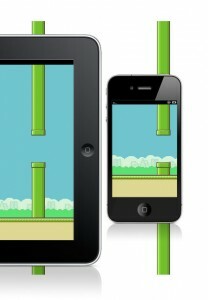 A pair of pipes is created outside of the right screen edge. The lower pipe’s position is chosen randomly somewhere in the lower third of the screen. The upper pipe is added accordingly, considering the defined gap size. The zPosition for the pipes is chosen so that they always are rendered behind the ground. The bird collides with the moving pipe and is pushed out of the screen. This will move the pipes by a full screen width plus two times their texture width to make sure that the pipes are out of sight. Then, they are removed from the scene. Finally, we need to ensure that the spawnPipes method is called regularly to produce new pipes and attach the animation to it. This happens with an SKAction which is directly attached to the SKScene. 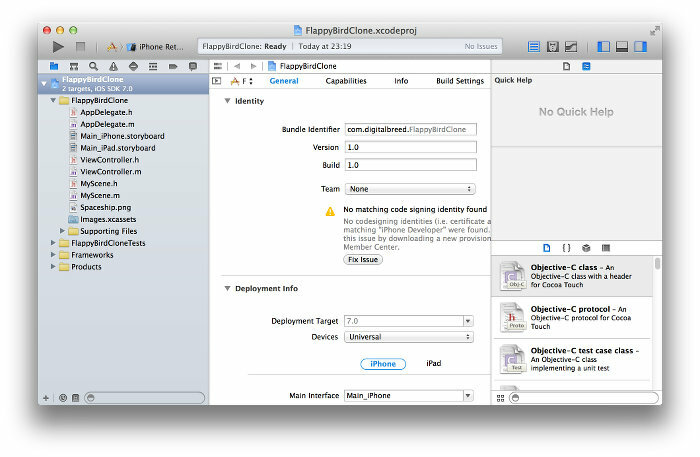 This action calls the spawnPipes method, then pauses for two seconds, then repeats. Now we’ve got beautiful repeating pipes. The game is over when the bird hits a pipe, so detecting a hit is our next challenge. SpriteKit provides a dedicated delegate for collision detection, SKPhysicsContactDelegate, which allows to respond whenever two physics entities are in contact. We will implement the delegate in our scene and set the physics world delegate to the scene. Moreover, we need to setup some categories for the different types of entities in the scene. Right now, all entities collide with each other and we would receive notifications for all these contacts because of the default setup: all relevant properties – discussed below – have value 0. We will use the categories to configure the contact testing in more detail. We can use the categories to configure which entities can collide with each other and for which types of collisions we want to get notified. This is useful for two reasons: 1. the physics engine doesn’t need to test for collisions between e.g. the pipes and the ground (which saves some performance) and 2. we don’t require notifications for all possible types of collisions. SpriteKit provides three physics body properties for that purpose: categoryBitMask says to which categories an entity belongs, collisionBitMask says which categories can collide with the entity and contactTestBitMask says which contacts lead to a notification. Note the separation of collision (actual interaction with the physics world) and contact (sole collision testing without any reaction in the physics world)! The latter two fields allow to produce three different scenarios: 1. contacts between entities are ignored, 2. contacts are notified but nothing happens in the physics simulation, 3. contacts are notified and applied to the physics world. The definition for the ground entity is a little easier. We only need to assign the category but do not request any collision notification/reaction. For the player nothing has changed: the bird still collides with the world. But the internals are now configured in a more sensible way. Now we need to implement the contact notification method as required by the delegate. In order to visualize the collision, we will flash the background a little. That’s why we stored the sky color at the beginning of the tutorial! We’re using a symbolic identifier for the SKAction here for the first time. That way, we can remove any previously created SKAction with the same name. 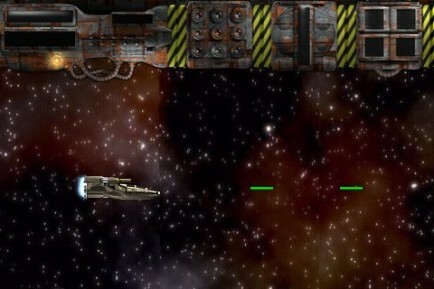 When you start the game now, you’ll see the background flashing red in case of a collision. In order to stop the world movement and disable player control of the bird in case of a collision, we can make use of the speed property of the SKNodes. Setting the speed to 0 means that all running SKActions are paused. In order to avoid setting the speed property on every individual moving entity in the scene, we create a dummy parent node called _moving which holds all moving entities: the pipes, the background, the ground. Once again we use an ivar to make it accessible from all methods. The entity is created at the beginning and added to the scene. All moving entities are added to this parent node. Now that we have all moving parts except the bird under one parent node. In order to stop animations, we can set the speed of _moving to 0 in case of contact. The parent’s speed is applied to all child nodes. We also want to happen this exactly once. We’re not interested in any further contacts once the animation has halted, so we wrap the whole method in a corresponding if. You might have noticed that we did not add the bird to the _moving node. This is because we still want it to move and animate. We just need to retain player control from the bird by allowing touches only with _moving.speed > 0. Before we can restart the game, we need some way to reset the entire scene: the bird has to be moved to its initial position, its physics properties have to be reset, existing pipes have to be removed and the animation has to be restarted. Most importantly, this shouldn’t start immediately after a collision but after a little delay and an explicit user click/touch. Let’s keep track when the user is allowed to restart the game in a new ivar _canRestart. We will initialize this flag to NO because it’s not relevant during a running game. But we’ll change the flag to YES after a collision and after the background-flash-animation has finished (that should be enough game-over-drama for the sake of this tutorial). For that purpose, we can use another kind of SKAction, one that supports block execution. We simply append it to the flash-animation. Now, if the game finished due to a collision and the user is allowed to restart, we can simply make use of the flag in the touchesBegan method and reset the scene after click/touch. But wait, where’s that resetScene method coming from? Right, we still need to implement it. How would we do that? We can easily reset the bird, restart the animation and reset the _canRestart flag, but how can we reset the pipes? Right now the existing pipes are direct children of the _moving container and we have no way to easily distinguish them from other nodes like the ground or skyline. In order to easily access the pipes and remove them from the scene, we will restructure the scene hierarchy one more time: We will introduce another artificial parent node for all pipes, add this node to the existing _moving node and add all pipes to this new parent node. …and all created pipes added to this node instead of the _moving node. An idea to make the crash even more spectacular would be to add a little feather particle system. But maybe that’s something for another tutorial. The first thing to do for score counting is to actually display the score. 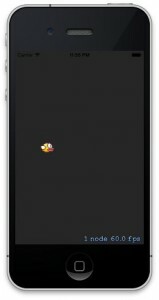 SpriteKit provides SKLabelNodes, which are meant to display text in the scene. iOS 7 comes with plenty of fonts to choose from, I decided to go for “MarkerFelt-Wide”. Eventually we should switch to a more fitting bitmap font, but this should do for now. To keep track of the score and the label, we’ll first add two new ivars. Now we’ll initialize the ivars and add the label to the scene. Add this at the end of the /* Setup your scene here */ block. The score should increment whenever the bird has passed a pair of pipes. The easy way, as suggested in the comments, would be to simply increment the score when the pipes have left the screen and are removed from the scene graph. However, this would also mean a little delay until the score is counted. Instead, we will create an SKNode right “after” (meaning: to the right of) the pipes with a physics body with contact detection enabled. 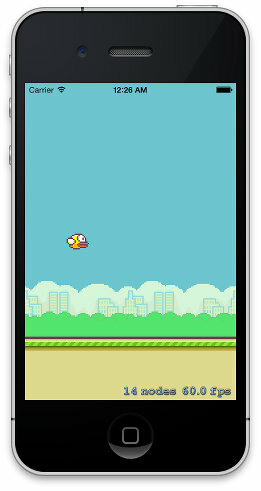 If you run the game now, you’ll see that the bird crashes shortly after passing a pair of pipes. This happens because the contact of the bird’s physics body with the contactNode’s physics body is detected and - (void)didBeginContact:(SKPhysicsContact*) is called, but we currently do not distinguish whether the bird is in contact with the world or something else. We can make use of the collision categories again and add a dedicated one for the score area. We assign this category to the score node that we created right before. Now we can handle the different types of contacts properly by investigating the SKPhysicsContact object passed to the didBeginContact method. It has two properties representing the two physics bodies in contact, bodyA and bodyB. If either of these two physics bodies is of category scoreCategory, we can increase the score. In all other cases, the bird collides with the world. The only thing left is to reset the score to 0 in the reset method. The score update is a little boring. You can easily add some visual feedback by using some SKActions to scale the score for a short moment. The action scales the score text up to 150% of its size of 1/10th of a second and then back to the original 100% in another 1/10th second. I need to emphasize that there are dozens of other possible ways to implement the game mechanics. For example, the world movement and score counting could easily be done in the update method. The movement could be implemented depending on the passed time since last frame and the counting could be implemented depending on the pipe’s horizontal position. Even collision detection is so trivial that you don’t need the physics engine for that. On the other hand, look how easy it was to implement the bird’s behavior! You would also normally not load all sprites into separate files but use texture atlasses instead (i.e. as many sprites as possible on one texture) because texture switches are an expensive operation on the graphics card. From a software engineering perspective there is also plenty of improvement potential, like moving the score update functionality into a dedicated method, or even a subclass of SKLabelNode with dedicated increment/reset methods. If you think that something needs to be covered in more detail, feel free to leave a comment or contact me on Twitter (@digitalbreed). I will try to update the tutorial or respond to you directly. If you liked this tutorial and you have some Bitcoins to spare, I would appreciate a tip at 1QByEN4aeEN1KKqikBFUGdgeg1ZCX6c1nr. I have pushed the tutorial code to GitHub. To celebrate sechsta sinn's 10th birthday, here's another video taken directly from the DVW game engine. KPB bombers attack a Bunkermenschen base. Silently, we passed our 10th anniversary some days ago. As a little gift, here’s an older video right from the DVW game engine. I stumbled across an interesting concept. 14 independent developers get one slot per week on iDevBlogADay.com to publish articles; if they don’t blog, the spot is given to the next developer on the waiting list. It took some time until I finally could get back to my little Android game and I must admit that this wasn’t really a “day” I worked on it. Instead, it were multiple, scattered and short sessions where I worked on the collision testing and response code, some effects and UI stuff. It’s simply too hot currently… so bear with me that there’s no cool video this time. Keep reading below if you’re interested in the recent progress. Comments are welcome! In case you missed it, also don’t forget to read the earlier reports on my steps in Android game development: Steps 1-3, Step 4, Step 5. Day #5, Sunday, June 27th. Here’s the rough concept for timed events I already mentioned in my last posting. It’s working for now, but I’ll do some more tweaks to abstract this even further and make it more flexible. Android Game Development – Steps 4-5 from Matthias Gall on Vimeo. Keep reading below if you’re interested in today’s progress. Comments are welcome! In case you missed it, also don’t forget to read the reports on my steps in Android game development: Steps 1-3 and Step 4. Tagged android, Game Development, gamedev. Day #4, Saturday, June 26th. Keep reading below if you’re interested in today’s progress. Comments are welcome! In case you missed it, also don’t forget to read the report on my first three steps in Android game development. I’m building rather boring enterprise applications at work and I love creating more appealing things in my spare time, so I do a bit of game development whenever I can. The main problem for a programmer is to get some graphics, but fortunately I have some nice renderings from my old Project E tutorial and the even older Project D game by sechsta sinn on my harddisk that I could put into use (all done by my friend and favorite artist Martin Ernst, btw.). This is what I managed to do in three after work sessions so far, if you’re interested in the details, continue reading after the video. Android Game Development – Steps 1-3 from Matthias Gall on Vimeo. Tagged android, Game Development, gamedev, java. There are a very few people who are genius, disciplined and focussed at the same time and thus can put their productivity to a maximum. One of the most talented guys in the Indie gamedev scene I’ve seen so far in that regard is Tomas “DrPetter” Pettersson. Late 2007 he already came up with a really useful little tool called SFXR (not to mention the even more impressive Musagi) and now it got even better. Within only six months he produced an amazing 3D mesh sculpting tool called Sculptris, now available as version 1.0. Check out his trailer and see for yourself. Don’t ever say it’s almost done. Chris Pruett at Google I/O on Android Game Development. Besides that quote I used as the post caption he shows some very interesting ideas how he analyzed the behavior of his users in order to improve their game experience. I love that hotspot idea, probably something useful for my friends working on Glow as well. Apple, Google, whatever… they all have their downsides. But they bring so much innovation that I’m eagerly looking forward to seeing more cool things becoming reality in the next years and building cool things with them myself. Christopher, one of my highly-paid sechsta sinn colleagues, has spent some of his expensive hours to compile a panorama screenshot of a DVW map. But it all pays off when the fans are happy. Click here for the fully blown version.